ADA, Minn. (August 23, 2018) – Norman County Raceway’s 100th anniversary season came to a close Thursday night with a great crowd on hand. The speedway’s youth movement was seen in full effect as two drivers set records with their championship efforts. Brady Petermann of Hawley, Minn. collected the Sanders Metal Products IMCA Modified track championship. In doing so, he became the youngest driver to claim the championship in the track’s premier division at 19 years old. Brody Carlsrud of Moorhead, Minn. became the youngest driver in track history to claim a track title. The 15-year-old won the INEX Legends championship by just one point over Alex Braseth. Carlsrud, who is in his second season behind the wheel of a Legend, finished inside of the top 10 in all six events at NCR, including three top-five finishes. 15-year-old Brody Carlsrud became the speedway’s youngest track champion with 2018 legends title. Tim Estenson cruised to the Seedex Legends feature win. The win marked his 25th win of the season and 51st career Legends victory. In thrilling fashion, Aaron Wetterlin of Moorhead, Minn. collected his first career Norman County Raceway track championship in the Titan Machinery IMCA SportMods. After falling to the back early in the feature after spinning in turn two, Wetterlin got up on the wheel and charged his way back to the front. 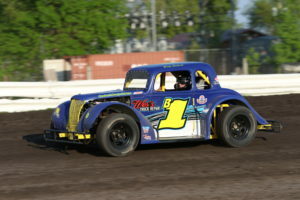 With Wetterlin restarting in the back, Kelly Jacobson, who entered the night three points behind Wetterlin, held the point lead as the race resumed. The usually mild-mannered Wetterlin aggressively wheeled his way back into contention for the win. Coming to the checkers on the final lap, Wetterlin went three wide with Jacobson and Andy Wagner. Jacobson held on for second, while Wagner and Wetterlin finished third and fourth, respectively. Wetterlin’s fourth-place finish was good enough to grab the title by one point over Jacobson. Jacobson’s father, Scott Jacobson, dominated the SportMod feature. Tim Shiek of Fargo, N.D. led every lap of the Christian Brothers Ford IMCA Hobby Stock feature. Shiek picked up his third win of the season and the points championship. Rob VanMil stole the lead from Rick Schulz in the late going of the Norman County Implement IMCA Stock Car feature. VanMil went on to win both the feature and the championship. VanMil, who runs regularly in the Modified ranks, has been driving his father, Corry’s, Stock Car all season after health issues sidelined him for the season. The Christian Motors WISSOTA Midwest Mods also had a driver sweep the night. Brock Gronwold of Fergus Falls, Minn. led every lap en route to clinching the feature win and track championship. Gronwold held a healthy lead at the midway point of the race while brothers-in-law, Matt Schow and Reise Stenberg, fought for the second spot. The two drivers raced side by side for four consecutive laps before Stenberg claimed the position. The IMCA Modifieds were five laps into their main event when the skies opened up. The race surface quickly became unraceable and the race was called official. Jamie Trautner was awarded the win.